Photo shows MNPV12 with either breakers or fuses which can be separated or combined. 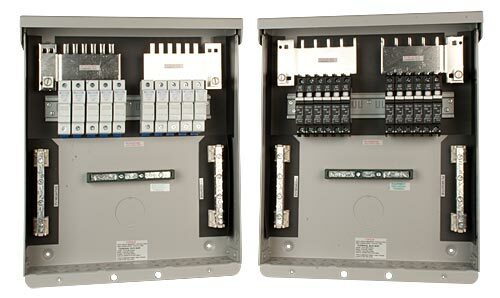 Includes 2 isolated 15 position PV negative bus bars, 15 position ground bus bar, and 200 amp Plus bus bar for breakers and fuses. Plus busbars can be combined or separated to support 2 inverters or charge controllers. (For 150 VDC charge controllers and 600 VDC grid tie inverters) Gray aluminum type 3R rainproof enclosure with insulating dead front, will accept 12 150VDC breakers or 10 touch-safe fuse holders. Can support two inverters of up to 5 strings each, or a transformerless inverter of up to 5 strings. MNTS - Touch Safe Fuse Holder for10x38 mm fuses 1000VDC 30 amp Din rail mount Use in the MNPV combiners for high voltage string inverters. Goes with MNTS fuse holder. The fuses are industry standard 10mm x 38mm fuses. The MidNite Solar 600V Surge Protector Device (MNSPD) is a Type 2 device per UL1449 rev3 and has an outdoor rating of 4X for outdoor use. Protection for grid-tie PV combiners and inverter input circuits. This 1/2 in 600V Heyco Strain Relief accepts two 5mm PV wires. Nut is included.